So, I see an abundance of gift guides for women, but I hardly see as many for men. If you were to ask me what to get for my girlfriends, trust me, I already know. Girls tell each other generally. If you ask me what to get my mom, I already know what she needs. If you ask me what to get my sister, easy peasy. But men...I always have question marks on what to get for my guy friends, for my father in law, brothers, best friends husband, those are the difficult questions. In general, guys aren't pinning what they want and making lists and dropping hints like the ladies do(which, there is nothing wrong if for some reason your guy does that. He is just in the 5% of men who do). So I decided to just do a Gents Holiday Gift Guide this year, because this would help me the most as well! I did my own research on my favorite handmade leather goods, the perfect face/body/beard essentials, and the most inspiring travel apparel items. And a note for you that are overwhelmed with this season, for me this holiday season has never revolved around the gifts, while they are fun to give, It is all about Jesus Christ and sharing his story and love with others(which is also an everyday thing as well in the lives of Christians). So don't stress out too much about the gift giving/wrapping process. Make it a way to bless others and never expect anything in return. It's always the thought and the heart behind the giving that counts! A simple handwritten card would suffice for me! God's grace is so good I never technically "need" anything! So have fun and be a blessing! Argentinian leather pouch for the musician, artist, writer, or gent needing a hip pen holder. Handmade with triple sewn Italian Veg Tan and American hand poured brass hardware. These coasters are pretty legit. Handmade from a 9/10 ounce American leather and hand dyed. This intricate leather watch is of Scandinavian design and has an interchangeable strap option. US steer 4 oz latigo leather bounds this simple and masculine wallet designed for a pocket. This facial cleanser uses Juniper Berry from gin. Barber Shop locations in NYC + Brooklyn. Handmade from organic ingredients, conditions your skin + helps stops itching. Like I always say, a top notch brand will get me. Their scents are on point + so is their website. A blade subscription, in case you forget to pick up a new one. They come right to your door. Yes, hair AND body. For the man who doesn't want to use two different bottles. Amazing scent. This San Francisco crowdsourced clothing company makes artisan quality American garments. Handmade denim jeans from Greenville, SC. Order them directly or go to Tweeds in Atlanta, GA. This bouclé wool and alpaca-blend overcoat is perfection for any stylish and traveling man. This hand knit peruvian highland wool beanie will make your head immensely happy and warm. Any traveling man can outwit the airlines checkpoint with this legit TSA compliant Backpack. 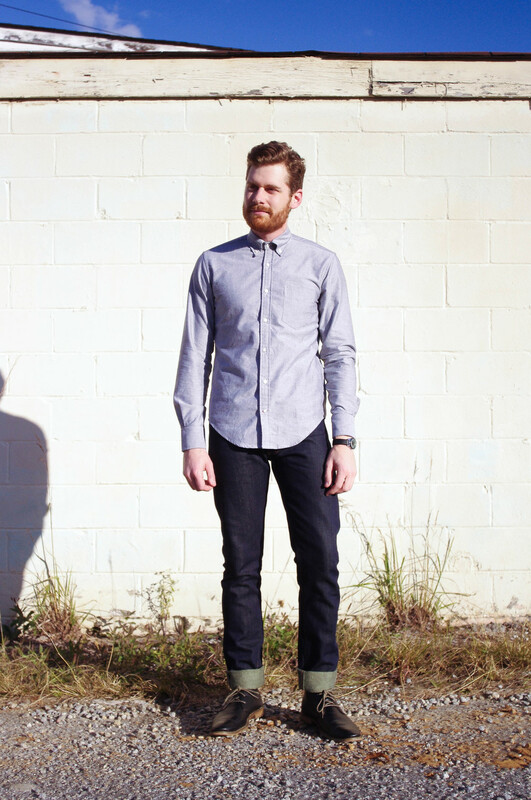 Also, here is a mini lookbook of the Gustin Shirt + Denim. The model is my brother in law, Jonathan. I love that we are able to work together more often lately!